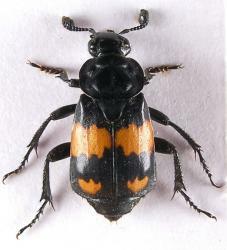 The burying beetle Nicrophorus vespilloides has been used as a model to understand the evolution of many complex social behaviors; such as, parental care, sibling-sibling conflict, parent-offspring conflict, mating conflict, and the genetic architecture of these behaviors. In recent years several laboratories have started to make N. vespilloides a molecular tractable organism. This page contains several genetic and genomic resources for N. vespilloides as well as curation tools to help the N. vespilloides research community coordinate efforts to improve these resources. Please cite the paper "The Genome and Methylome of a Beetle with Complex Social Behavior, Nicrophorus vespilloides (Coleoptera: Silphidae)" when using this dataset. Nicrophorus vespilloides Herbst, 1783 by TheWCG is licensed under a Creative Commons Attribution-Non-Commercial-Share Alike 2.0 UK: England & Wales License.